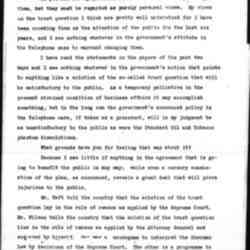 Mr. Perkins, the American would like your views on the government's action in the Telephone case. If you ask for my personal views I do not mind expressing them, but they must be regarded as purely personal views. My views on the trust question I think are pretty well understood for I have been crowding them on the attention of the public for the last six years, and I see nothing whatever in the government's attitude in the Telephone case to warrant changing them. I have read the statements in the papers of the past two days and I see nothing whatever in the government's action that points to anything like a solution of the so-called trust question that will be satisfactory to the public. 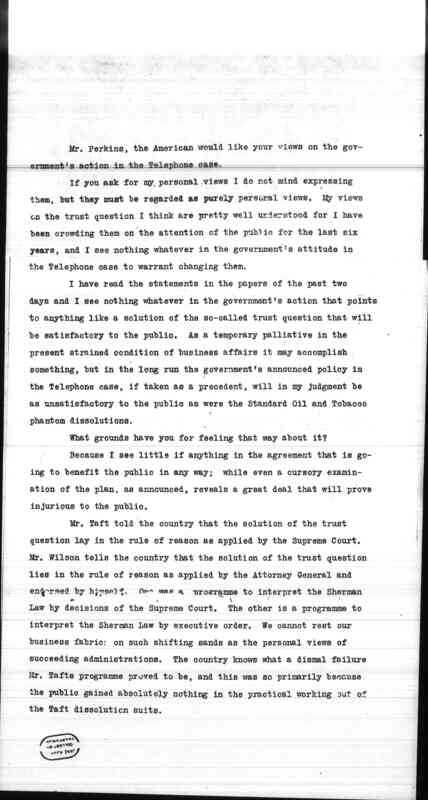 As a temporary palliative in the present strained condition of business affairs it may accomplish something, but in the long run the government's announced policy in the Telephone case, if taken as a precedent, will in my judgment be as unsatisfactory to the public as were the Standard Oil and Tobacco phantom dissolutions. What grounds have you for feeling that way about it? Because I see little if anything in the agreement that is going to benefit the public in any way; while even a cursory examination of the plan, as announced, reveals a great deal that will prove injurious to the public. With all due respect, it seems to me that the Wilson policy of personal and private negotiation, case by case, as now announced, will fail for the same reason. In the first place Mr. Wilson says in his note of the 19th to the Attorney General that "he is glad to know that the Telephone Company will adjust its business to the conditions of competition." If there is any business that cannot and should not be adjusted to competition, that cannot be efficiently conducted along competitive lines, it is the telephone business. We might just as well try to conduct the postal business on a competitive basis. Anyone who has been in a town in which there is more than one telephone company knows how inefficient, unsatisfactory and costly the telephone service of that town is. 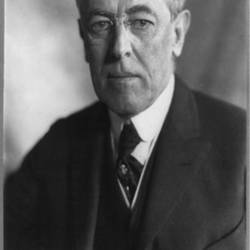 I cannot but believe that Mr. Wilson's proposition of establishing competition in the telephone business is economically and fundamentally unsound. If that is going to be done we are embarked on a thoroughly reactionary [program]. 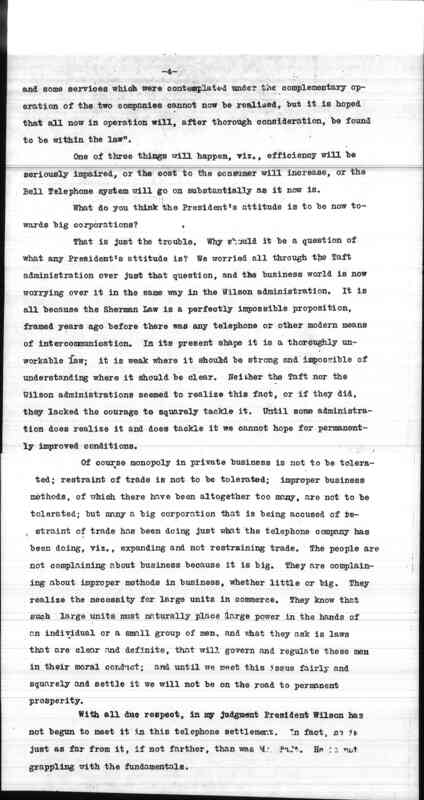 The telephone business of this country must be carried on in one of two ways; either through governmental ownership, as is the postal business, or by a great telephone system under the direct supervision and control of the federal government, as the railroad and banking business are now conducted. 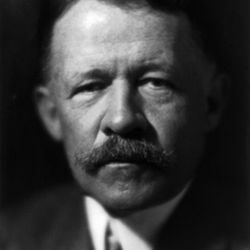 Postmaster-General Burleson, in his report of last Wednesday, recommending to the attention of Congress the taking over by the government of the telephone and telegraph lines, refers to the business as monopolistic in nature, and Mr. Burleson is right. If competition is not to be restored and the telephone company is, to a certain extent, to extend its control of operations over the lines of various independent companies, as would seem to be the case, how is this extended control to be safeguarded in the interests of the public? 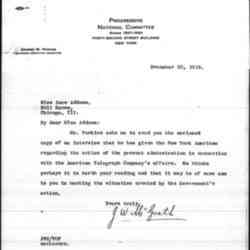 Was the telephone company's alliance with the Western Union in restraint of trade? Did it put up prices or did it increase business and add to the public convenience? Who benefitted most, the companies or the public? 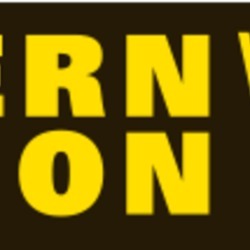 There is certainly no one in business and I doubt if there is [anyone] who believes that the acquisition by the American Telephone Company of a 30% interest in the Western Union Telegraph Company resulted in restraining trade. If there has been a shining example of [cooperation] resulting in the expansion of trade, benefit to the public, cheapening of rates, improving efficiency, it has been this very [cooperation] between the Bell system and the Western Union system. Why, just look at it. 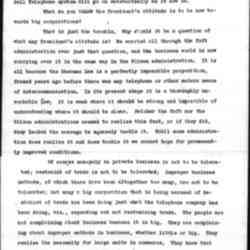 It gave us the night letter rate message, the [page 3] day rate message; it gave us the improved service of picking up a telephone and telephoning a telegram and receiving an answer in the same way; it gave us more rapid communication, more efficient communication, more economical communication. Mr. Wilson himself in his speeches and papers has questioned the ability of large corporations to do business efficiently and has rather intimated that efficiency was the test. Here we have a most striking example of improved and reduced cost, and yet the government proposes to step in and disrupt this cooperative arrangement. As far as restraint of trade is concerned in this arrangement, every business man knows that trade has been expanded, has been quickened, has been greatly helped by the cheap rates and efficient service of the night letter alone. 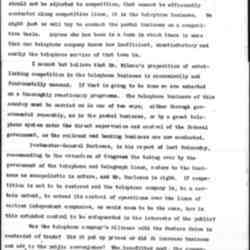 Mr. Perkins, it is said that the independent companies will largely benefit by this arrangement and that they can connect with the Bell Telephone trunk lines. What is your understanding about this? 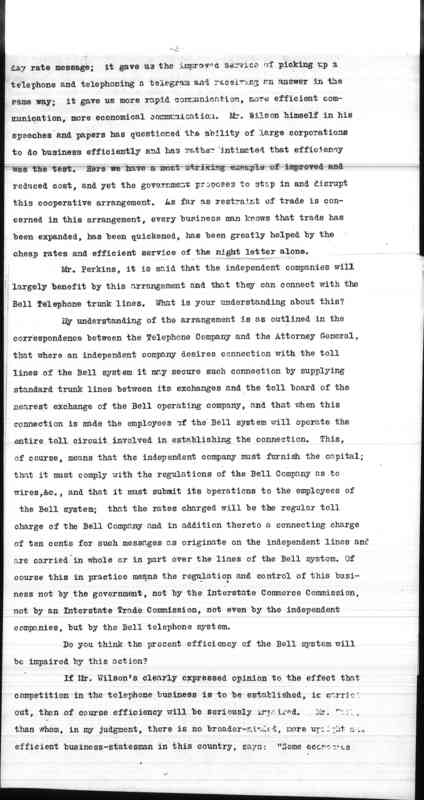 My understanding of the arrangement is as outlined in the correspondence between the Telephone Company and the Attorney General, that where an independent company desires connection with the toll lines of the Bell system it may secure such connection by supplying standard trunk lines between its exchanges and the toll board of the nearest exchange of the Bell operating company, and that when this connection is made the employees of the Bell system will operate the entire toll circuit involved in establishing the connection. 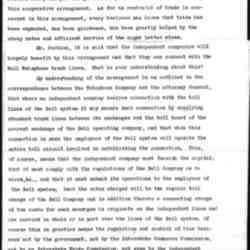 This, of course, means that the independent company must furnish the capital; that is must comply with the regulations of the Bell Company as to wires, &c., and that it must submit its operations to the employees of the Bell system; that the rates charged will be the regular toll charge of the Bell Company and in addition thereto a connecting charge of ten cents for such messages as originate on the independent lines and are carried in whole or in part over the lines of the Bell system. Of course this in practice means the regulation and control of this business not by the government, not by the Interstate Commerce Commission, not by an Interstate Trade Commission, not even by the independent companies, but by the Bell telephone system. Do you think the present efficiency of the Bell system will be impaired by this action? 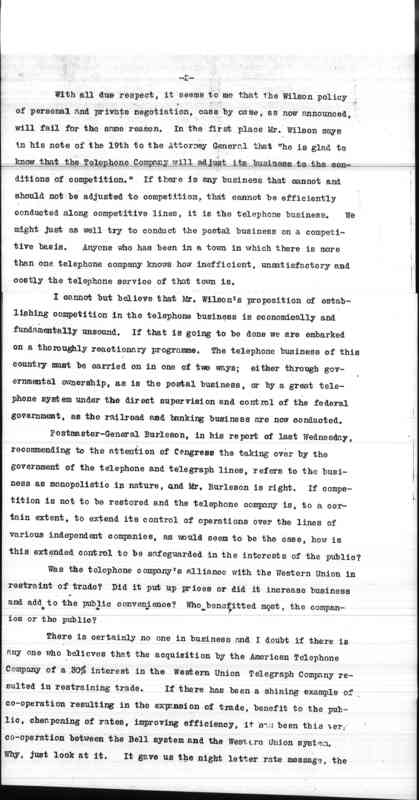 If Mr. Wilson's clearly expressed opinion to the effect that competition in the telephone business is to be established, is carried out, then of course efficiency will be seriously impaired. Mr. [Wilson] than who, in my judgment, there is no broader-minded, more upright and efficient business-statesmen in this country, says: "Some economics [page 4] and some services which were contemplated under the complementary operation of the two companies cannot now be realized, but it is hoped that all now in operation will, after thorough consideration, be found to be within the law". One of three things will happen, viz., efficiency will be seriously impaired, or the cost to the consumer will increase, or the Bell Telephone system will go on substantially as it now is. What do you think the President's attitude is to be now towards big corporations? That is just the trouble. Why should it be a question of what any President's attitude is? 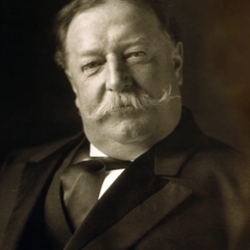 We worried all through the Taft administration over just that question, and the business world is now worrying over it in the same way in the Wilson administration. It is all because the Sherman Law is a perfectly impossible proposition, framed years ago before there were any telephone or other modern means of intercommunication. In its present shape it is a thoroughly unworkable law; it is weak where it should be strong and impossible of understanding where it should be clear. Neither the Taft nor the Wilson administrations seemed to realize this fact, or if they did, they lacked the courage to squarely tackle it. Until some administration does realize it and does tackle it we cannot hope for permanently improved conditions. Of course monopoly in private business is not to be tolerated; restraint of trade is not to be tolerated; improper business methods, of which there have been altogether too many, are not to be tolerated; but many a big corporation that is being accused of restraint of trade has been doing just what the telephone company has been doing, viz., expanding and not restraining trade. The people are not complaining about business because it is big. They are complaining about improper methods in business, whether little or big. They realize the necessity for large units in commerce. 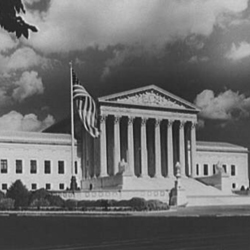 They know that such large units must naturally place large power in the hands of an individual or a small group of men, and what they ask is laws that are clear and definite, that will govern and regulate these men in their moral conduct; and until we meet this issue fairly and squarely and settle it we will not be on the road to permanent prosperity. Then, Mr. Perkins, what do you think ought to be done? I have long been for a Federal Interstate trade Commission that will regulate and control interstate industrial corporations. 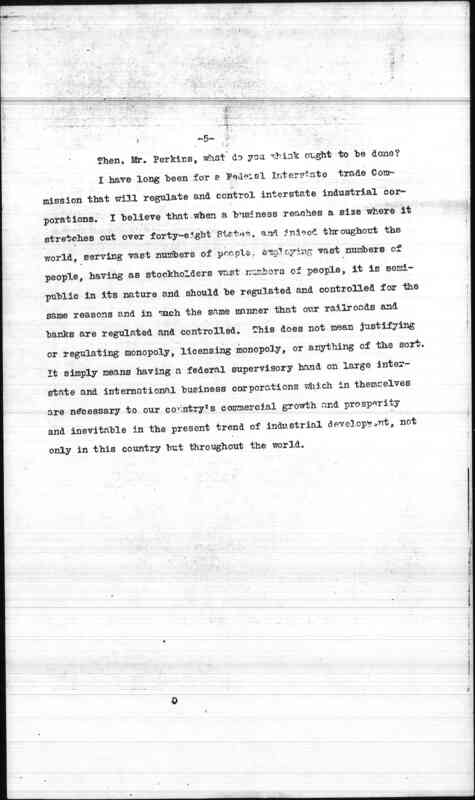 I believe that when a business reaches a size where it stretches out over forty-eight States, and indeed throughout the world, serving vast numbers of people, employing vast numbers of people, having as stockholders vast numbers of people, it is semi-public in its nature and should be regulated and controlled for the same reasons and in much the same manner that our railroads and banks are regulated and controlled. This does not mean justifying or regulating monopoly, licensing monopoly, or anything of the sort. 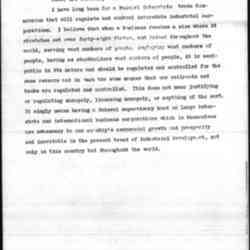 It simply means having a federal supervisory hand on large interstate and international business corporations which in themselves are necessary to our country's commercial growth and prosperity and inevitable in the present trend of industrial development, not only in this country but throughout the world. 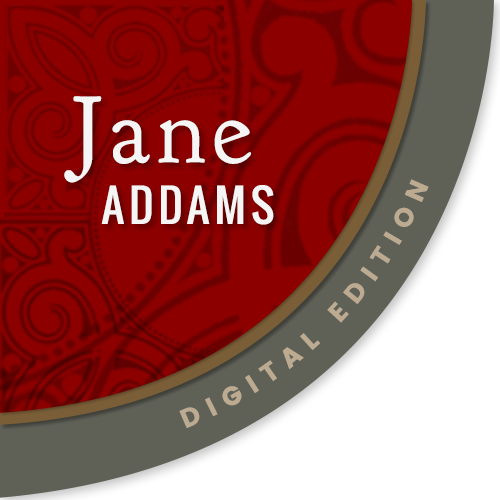 New York American and Perkins, George Walbridge, “Interview with George Perkins, December 1913,” Jane Addams Digital Edition, accessed April 18, 2019, https://digital.janeaddams.ramapo.edu/items/show/7596.